When Tommy Ellis drove through the tunnel and saw New Hampshire Motor Speedway for the first time in July 1990, the veteran stock car racer from Richmond, Va., made a bold prediction. And that’s exactly what Ellis did, topping a stellar 46-car field that included Dale Earnhardt, Harry Gant, Dale Jarrett, Michael Waltrip, Jeff Burton, Kyle Petty and Ken Schrader. Ellis started fourth in the No. 99 Goo Goo Clusters Buick and led three times for 89 laps en route to winning the Budweiser 300 on July 15, 1990. The race, which was part of what is now the NASCAR XFINITY Series (formerly Nationwide), was slowed by numerous incidents that resulted in 17 caution periods and Ellis had more than one anxious moment. Ellis was a tougher-than-nails, 42-year-old racing veteran when he pulled into New Hampshire Motor Speedway’s victory lane. Late Model Sportsman competition and Ellis’s career took a dramatic turn in 1982 when NASCAR brought the nomadic stock car racers together as part of the new NASCAR Budweiser Late Model Sportsman Series, the predecessor to today’s NASCAR XFINITY Series. 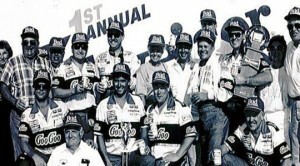 The record books show Ellis won 22 NASCAR XFINITY Series races in 235 starts between 1982 and 1995. He also had six top-10 finishes in 78 NASCAR Sprint Cup Series races between 1976 and 1991. Interestingly, the 1990 season in which Ellis won at New Hampshire Motor Speedway was the last year he contested a full NASCAR schedule. He made only sporadic series starts over the next five seasons before finally hanging up his helmet and dropping off the racing radar. When we caught up with the now 67-year-old former racer, Ellis was rolling down the road, heading home after a full day in his dump truck. “I hauled eight loads of gravel today,” Ellis said. “I haul gravel, mulch, topsoil and whatever anybody wants. I don’t advertise, but if somebody needs something that knows me they can call me up and get me to haul it for them. Ellis says winning the inaugural race at New Hampshire Motor Speedway was a highlight of his career. For more details and ticket information on events at New Hampshire Motor Speedway, or to purchase tickets to the September SYLVANIA 300 NASCAR Sprint Cup Series weekend, please stop by our Ticket Office, visit the speedway website at www.nhms.com, or call our Ticket Hotline at (603) 783-4931. Are you covering at Loudon this weekend?